The escape to Volta region started from Noguchi Memorial Institute for Medical Research. Our co-ordinator, jovial as usual was there to see us off, and there we hit the road… excited as Dr. Nguta kept us all entertained throughout the trip.The first stop was at the Tafi Atome Monkey Sanctuary, excitement was ignited to see monkeys bob on some of us for bananas, giving a glimpse of the spirit of a nice get-away weekend from our routine work. It was an experience of true escape! We rested our first leg of the escape at Hempton Resorts Hotel in Hohoe where we enjoyed “spiced goat soup, tilapia, banku, abolo, apkele”, truly an appreciation of diversity in culture. The next day we started by burning out some calories at the beautiful Afadjato ridges, 885 metres above sea level. It was a good workout with pretty scenic views of all mountain ridges from different angles.Whenever we encountered the sign “Quitters never win”, on our way up the mountain, we got extra spirit to hike all the way to the top. Kudos to those of us who made it to the top! When we finally got to the top, we spent a few minutes, and decided to turn back, and wow!! the plateau we were standing on became illuminated with the sun. We saw a fantastic panorama in front of us, and for some moments we couldn’t believe our eyes. Seeing all those mountain ridges, cliffs and edges live and not on a nature documentary were like a revelation for us. Only the magnificent handwork of God at the Wli waterfalls could have brought so much refreshment, a walk to the Wli waterfalls was pleasurable with Mr. Matthew, our guide entertaining us all the way, ensuring even the tired ones were with us…..and there we were….enjoying the wonders of nature…..with the fruit birds! You will be mesmerized by this fascinating place! Even though we didn't escape, we were soooo close! We had a blast! We had a good “come-back”, truly revived to pick up from where we had left and determined to pursue our research endeavors to conclusions; Quitters never win!!. If you're feeling adventurous, hop out and hike Afadjato mountain and witness the splendid Wli waterfalls in the Volta region. 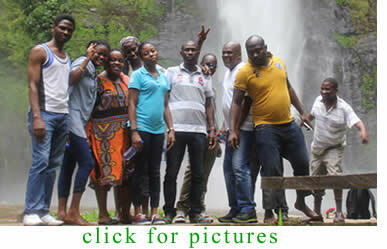 Your escape through the rich green canopy of Volta region forests is guaranteed to be an adventure in itself.